Everyday structures like walls and steps have artistic impact. Streams, rocks, and tree roots have their own architectural patterns. The sense of space and scale is perfect. Buildings like the well preserved colonial plantation bungalow, with its huge ceiling fan and open lattice panels, are works of art. This house wall displays and information on Singapore's famous orchid collection, and is set in beautifully sympathetic surroundings of greenery. 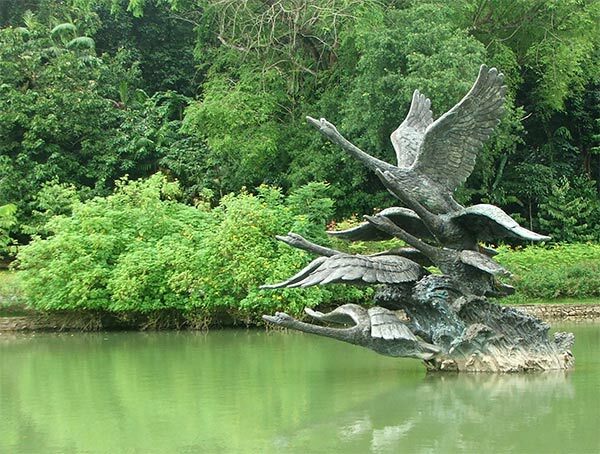 Structures like Swan Lake's Gazebo and the stage by Symphony Lake are clearly functional, and beautifully situated. The Singapore Symphony Orchestra gives concerts in the sound shell. But everywhere I looked I felt a sense of shape, and scale, and pattern. 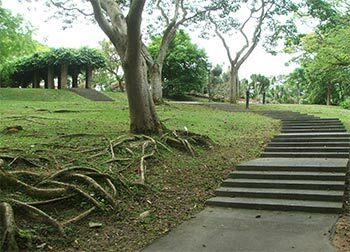 The first tree I met was a sculpture - a Malay fig whose branch-roots trailed down from its tree-face like dreadlocks and an unruly beard. 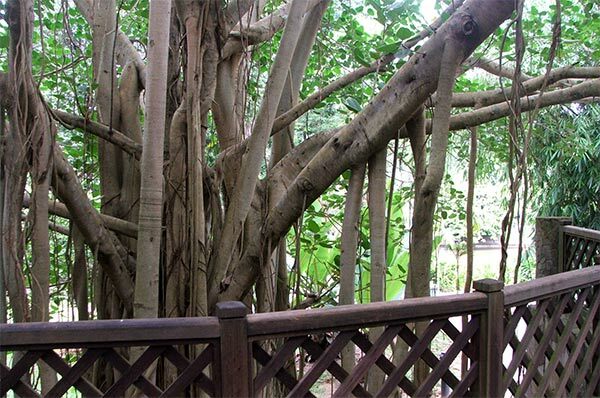 With a diagonal trellis fence, it overlooked Palm Valley, occupying a prime position. 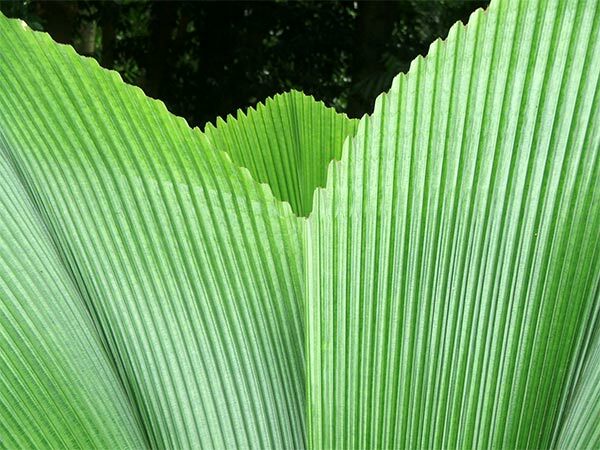 The very nature of tropical foliage is sculptural. The humans who laid the paths and built the steps have just carried on the great designs of nature. I liked the mass waves of Heliconias, and the mass lines of orchids in the Orchid Gardens. 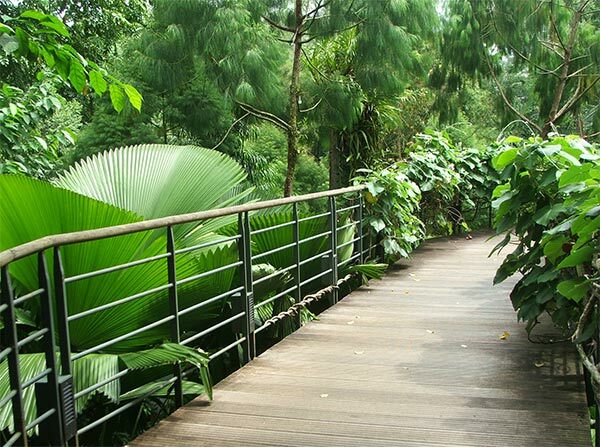 Wooden walkways stretched over Umbrella palms, with their huge diamond-shaped leaves. Geometric shapes delighted me even in the more traditional garden plantings. A series of archways clad in tropical climbers looked artistically elegant. 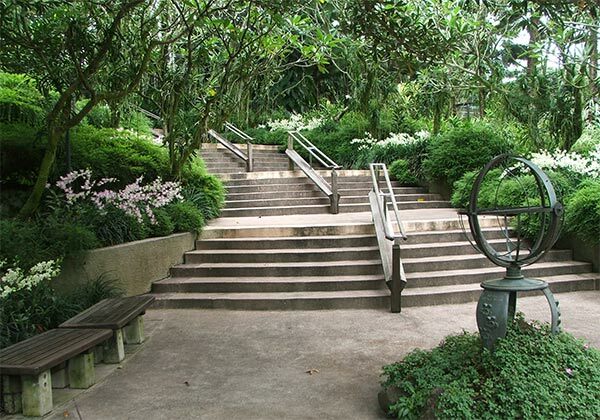 Sets of wide steps swept up and down the gentle hills - even the handrails had design impact. 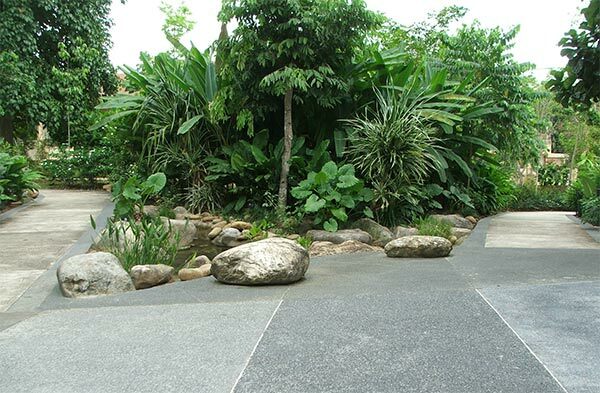 Flat surfaces, fat rocks, and greenery combined well in the newly designed Saraca Stream, which a visitor can follow down its gently sloping course. The gardens were a giant outdoor art gallery - and not a single red sold sticker in sight! Traditional sculptures were interesting, but seemed to have much less impact than the natural. In the middle of Swan Lake a group of swans, wings outstretched, reached up into the hot humid air. A collection of Bonsia trees were stylishly mounted on museum plinths in a circle by the old Band Stand. I missed the famous swinging girl, though... Oops. Best that I stop now, before I start talking about the inner harmonies in the counterpoint of animal, vegetable and mineral! But I really enjoyed the patterns of space in the Singapore Botanic Gardens. There's more to public gardens than wide paths, and huge trees, and glossy brochures!